Workers at the Brooklyn Metropolitan Detention Center say they and inmates there have been in the dark, without heat or hot water, for days, including during the arctic blast that brought bitterly cold temperatures. "It's only heat in the afternoon since we been complaining today, but for the last couple of days we been working with coats, hats, scarves," said employee Rhonda Barnwell. The Federal Bureau of Prisons said the facility in Sunset Park is experiencing a partial power outage but that "cells have heat and hot water, there is lighting in common areas, and inmates are receiving hot meals." But workers, lawyers and loved ones of those inside paint a different picture. "I'm worried about his condition because it's really cold out here, and he's been sick in here before," said a woman who hasn't been able to speak to her husband since Saturday because inmate phones and messages have been affected. Gleams of flashlights were seen shining through darkened windows at the facility Friday night. Workers say the problem causes greater risks. "We have dark spots where we are moving inmates and there's no light," said the worker. 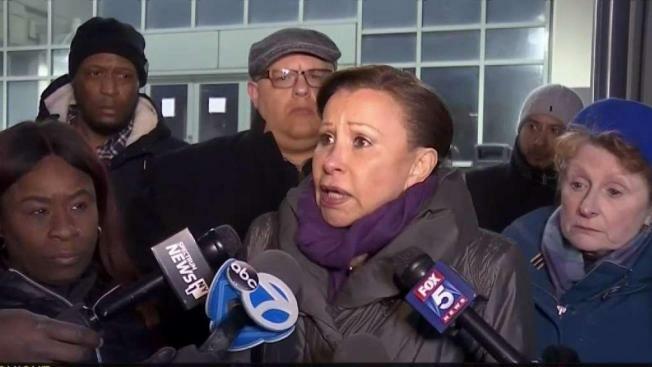 Rep. Nydia Velasquez said it's both a health and safety issue for workers and everyone else in the facility. The jail houses more than 1,600 inmates, some of whom are linked to high-profile drug trafficking and terrorism cases, while others are New Yorkers awaiting trial, according to the New York Times.